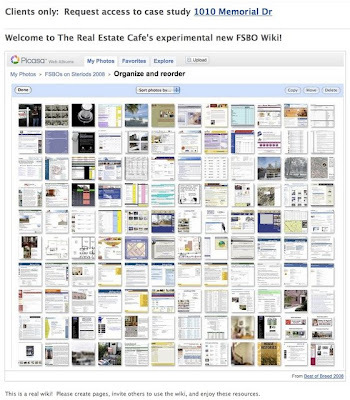 SNEAK PREVIEW: The Real Estate Cafe is eager to begin doing daily demos of our new FSBO wiki. The experimental site features “Best of Breed” money-saving tools and web sites for “do-it-yourself” sellers (FSBOs) at each step in the process. See screen shots on our FSBO wiki for some of the money-saving tools we’d like to demonstrate. We’re available on short notice to do 1 on 1, tabletop demos at locations easily accessible by public transit, or small group presentations / TweetUps at any mutually convenient location. Use this event planner to choose or suggest a date, time, and location that works for you, or call us at 617-661-4046. Or follow us on http://Twitter.com/RealEstateCafe to see if we announce any TweetUps this weekend.